First, there is Helene, the elegant, talkative woman who lives in a warmly decorated Arts and Crafts house in Chicago’s Andersonville neighborhood (with its Scandinavian immigrant history), and who recalls her well-to-do Danish upbringing during World War II, her long and deeply happy but childless marriage to a high school sweetheart named Lars (with whom she settled in Chicago), her emotionally wrenching adjustment to the loneliness of recent widowhood, and her abiding passion for Billie Holiday. 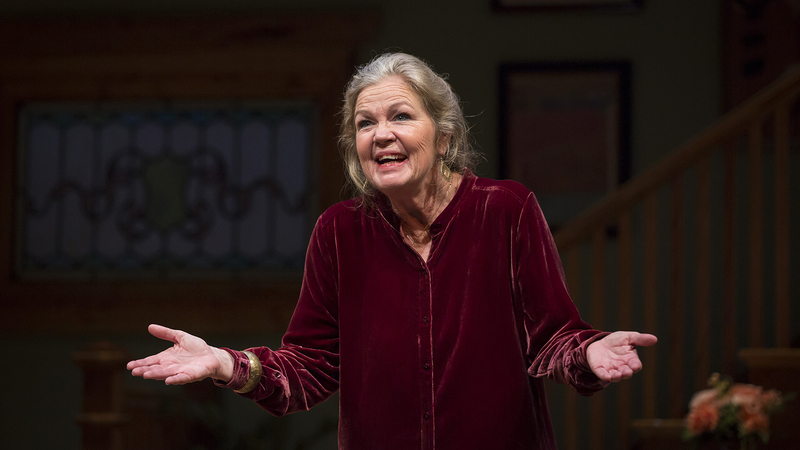 Helene, played with great skill by Linda Gehringer, is Orlandersmith’s largely fictional construct, based on Holiday’s own recounting of her real-life experience with a Danish family during that tour. But in this one-person play, Helene dominates the story. Holiday and, most crucially her music, can only really be “heard” in the imagination of the audience. Helene refers to the fabled titles and some lyrics from the songs she made famous (including the haunting “Strange Fruit”).Yet for whatever reason, possibly an issue with rights, there are only the rarest, heavily muffled echoes of those songs during the course of the 90-minute show. And that has a dulling effect. We first meet Helene in 2014. It has been just three weeks since Lars succumbed to cancer, and it is just minutes after her guests have departed following an elaborate memorial dinner she prepared for what had originally been planned as Lars’ 80th birthday party. She tells us about Jimmy, the nephew she adores, who is a fan of vinyl records, thinks she is “dope,” and has inherited his love of Billie from her. And she excoriates the low-brow, Schaumburg-bred blonde with German roots who is married to Thomas, Jimmy’s older brother, and who she loathes. Mostly she just has a great need to talk, to begin to come to terms with her loneliness, and to recall the crucial moments in her life: A traumatic experience with an older “family friend” that made her bond with “Lady Day” even stronger; the connection between Holiday’s hit, “Them There Eyes,” and her romance with Lars; and the sudden realization about Holiday’s abusive relationships with men and heroin addiction, which her father, a doctor, explains to her. And of course Orlandersmith, who is African-American, is keen on suggesting how Holiday experienced far less racial discrimination in Europe than she did throughout her life in this country, even if that continent was still reeling from its recent Nazi nightmare. Gehringer, directed by Chay Yew, brings all her vocal and physical skills to the table in an expertly measured and varied performance of grace and emotional truth that taps into both Helene’s girlish enthusiasms and her adult truths. And set designer Andrew Boyce’s detailed interior, full of books, plants and artwork, gives a fine sense of her decades of life in Chicago. But “Lady in Denmark” ultimately feels more like the audio book of a sensitively written novella. It is, quite simply, in desperate need of that other Lady’s voice. “Lady of Denmark” runs through Nov. 18 at the Goodman Theatre, 170 N. Dearborn St. For tickets ($15-$45) call (312) 443-3800 or visit www.GoodmanTheatre.org. Running time is 90 minutes with no intermission.